Sun Ra’s arrival—May 22, 1915—landed him in Gemini. He was named Herman Poole Blount by his mother. Szwed points out that the “Herman” was inspired by Black Herman, among the most famous of the early twentieth-century Afrocentric magicians immediately setting up connections to the metaphysical at birth. On his eleventh “arrival day” Great Aunt Ida gave Herman a piano. He began to play and read music without lessons. Having learned the names and locations of notes in school, he also secretly borrowed his sister’s Standard Music Book and taught himself to read music. Within a year he began composing as well as writing poetry. Great Aunt Ida also took Herman to live shows weekly, where he experienced, in person, music of Ethel Waters, Ida Cox, Duke Ellington, Fletcher Henderson, Fats Waller, Bennie Moten and dozens of others. 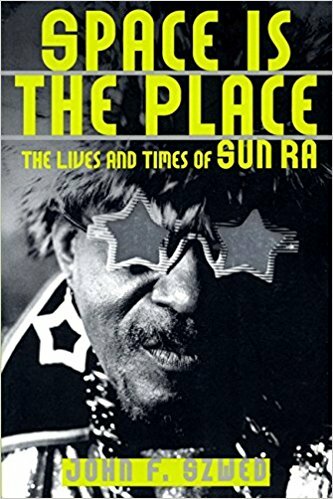 Szwed does a wonderful job of weaving Sun Ra’s early musical forays in with quotes, scenes from the Birmingham, Alabama, of his youth and experiences that profoundly affected him. College at Florida A&M proved easy academically for “Sonny,” and his formal private piano lessons with Professor Lula Hopkins Randall led to his assisting in teaching her theory class. Here he decides to tackle the “most difficult problem on the planet”—the meaning of the bible. It’s here too that we first hear of Sun Ra’s diary, discovered by roommates and subsequently destroyed. In it Ra had described, in great detail, contact from space men seeking a space traveler of sound mind to accompany them back to their planet. Which Sun Ra does, landing eventually on Saturn, where They tell him stop his teacher training and prepare for great chaos on Earth. Upon transport back to Earth They have him speak to a bewildered crowd in a courtyard outside an apartment in Chicago where he is living. Then he is lying on a park bench in New York City, the sky turns purple and dark red and he sees thousands of spaceships. A voice calls out, “You can order us to land. Are conditions right for landing?” Sun Ra says yes, They land. Bullets rain down but they’re not bullets, they’re like chewing gum, sticking people to the ground. Szwed wrestles with the implications of the story, retold many times by Sun Ra, in great detail over the years. A classic UFO abduction tale? Years later Sonny retells the encounter in front of MTV cameras and offhandedly says the people milling about in the courtyard were gentiles. Now the UFO abduction story takes on the air of a conversion experience and a call to preach the Afro-Baptist tradition where God calls the chosen by beams of light, celestial music and moving stars. At the age of 32, Sun Ra leaves Birmingham and moves to Chicago. He rejoins the Musicians’ Union and finds work first with bluesman Wynonie Harris and, later with the Lil Green band. At the Club DeLisa, where he spends many off nights, Fletcher Henderson has an orchestra in residence. Szwed describes the DeLisa as the Chicago equal of New York’s Cotton Club. Here Sonny introduces himself to Henderson on his first visit, and, on subsequent visits, takes every chance possible to chat with him. Then, the break comes, Henderson’s regular pianist, Marl Young, falls asleep in a car outside the club on a break and misses the show. Henderson asks Sonny to fill in, he sight reads the book and gets the gig. Chicago of this era is rife with intimations of Egypt. In the museums, the libraries, with street corner Egyptologists. Sun Ra learns that just as Osiris had been raised back to life from death by the ritual taught to Isis by the God of death, Thoth, the Egyptians thought the dead could be led down the path of Osiris and the rising sun to eternity. He learns the ranking and power of the Egyptian gods and feels a special affinity for Ra (or Re) of Heliopolis, the Egyptian sun god. Patrick eventually leaves, replaced shortly by saxophonist John Tinsley and then, ultimately, by tenor saxophonist John Gilmore. Bassist Earl Demus is added and, as the band performs more frequently, Alton Abraham gets involved as the band’s agent and Sun Ra the charismatic figure begins to arise in the public. Patrick returns to Chicago and Sun Ra rehires him. Abraham encourages Sun Ra to assemble a larger band and the Arkestra begins to take shape. He recruits Chess Records studio bass player Richard Evans, and trombonist Julian Priester. Jim Herndon, timpanist with the Chicago Civic Orchestra, and trumpeter Dave Young come on board. William Green (one of the first musicians to play electric bass), who sometimes replaced Evans, and bassist Victor Sproles were added. Sometimes two basses were used at rehearsals and on recordings. From time to time Von Freeman on alto Sax(!) and Johnny Thompson on tenor also joined the band. Charles Davis was added on baritone sax at times. James Scales on alto. Art Hoyle on trumpet. The final paragraphs of Space Is the Place offer a small glimpse of Ra’s vastness. Sun Ra refused to accept a fixed identity, or a locatable historical position, he resisted closure: Who was he? Where did he come from? How many records had he made? What was the meaning of his teachings? He effaced his biography and then built a structure to sustain his shifting identity... He assembled elements of music, dance and art which had never been witnessed together and yet at the same time seemed to allude distantly to tent shows, dance halls, and country churches as well as to real or forgotten empires. And he did it with a level of intention and seriousness which seemed no longer possible.